When I was finally able to meet my true relatives I was delighted to learn that I am a Pict, a Scot, Clan Campbell on both sides of my heritage. My ancestors the Picts were the famous tattooed warriors of Scotland, known worldwide as mercenaries easily visible in battles with their tattooed faces. It was in an attempt to hold them back in the Highlands that Hadrian’s wall was built. It happened that I met many of my true relatives and learned this heritage at the same time I began tattooing. It seemed a lattice of coincidence, that I was meant to do Celtic tattoos. I took it as my special goal to work to bring the intricate art of the ancient illuminated manuscripts and the Pictish standing stones to life in skin. I met my mentor Cliff Raven, himself of Irish descent, and I began to be tattooed by him and learn the craft of tattooing from him. He was infinitely kind and patient with me, and taught me to translate my pen and ink skills into their new application. On many pilgrimages to Celtic lands I have researched the manuscripts, tramped through muddy fields to see standing stones and Neolithic monuments, and spent many an hour in deserted graveyards with charcoal and paper, taking rubbings from high crosses. Everywhere I see patterns and motifs that suggest themselves as ways to embellish the human body. 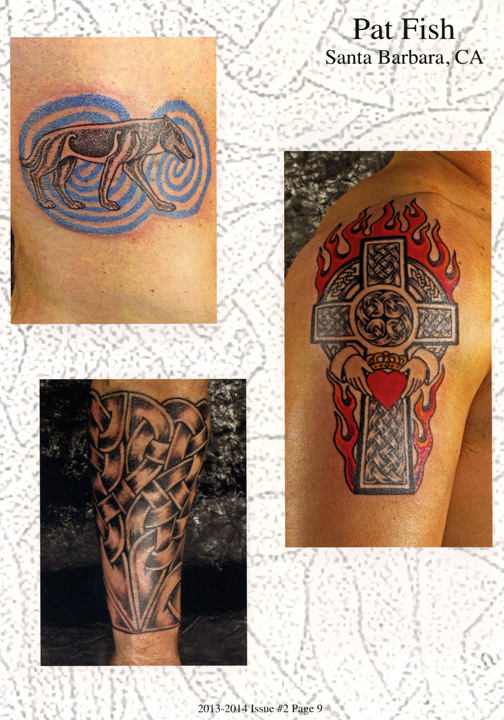 It has been a fortuitous choice for me, wanting to specialize in Celtic tattooing. I have a kind of dyslexia that allows me to be ambidextrous and see things backwards and forwards with ease, so looking at the negative spaces and interlacings in Celtic weaves is endlessly fascinating for me. The ancient monks and stone carvers had this same pleasure, working geometries and spirals to a pleasant representation of the intricacies of the universe. It is a wonderful life I have chosen. There have been many challenges and opportunities that I have been grateful for, fascinating clients and amazingly talented peers. It is my fervent wish to be granted many more years in which to explore the possibilities for translating Celtic and Pictish art into skin. Pat will be attending the 2014 Convention! An illustrated lecture about Celtic and Pictish art with an emphasis on historical sources and the adaptation of archival material to modern tattooing. Examples of ancient artworks and tattoos created from them, plus technical tips for successfully fitting Celtic knotwork patterns onto the body. Click here to return to the PAT FISH PUBLICITY page.